Emrah Yıldız is Assistant Professor of Anthropology and Middle East & North African Studies and a former College Fellow of the Judd A. and Marjorie Weinberg College of Arts & Sciences (2016-17) at Northwestern University. He is a historical anthropologist, specializing on routes of religious, commercial and political mobility between Iran, Turkey and Syria. His research lies at the intersection of historiography and ethnography of borders and their states; ritual practice, saints and visitation in Islam; as well as currencies and contraband commerce in trans-regional political economy. His current book project, The Ways of Zaynab via Turkey: Genealogical Geographies and Arrested Mobilities across Iran and Syria, brings these areas of scholarship into conversation as it follows the pathways of a ziyarat (visitation) route, often referred to as Hajj-e Fuqara’ (pilgrimage of the poor) from bus stations in Iran, through informal bazaars in Turkey, to the Sayyida Zaynab shrine in Syria. Yıldız’s dissertation that serves as the basis for this book project received the 2017 Malcolm H. Kerr Award in the Social Sciences from the Middle East Studies Association. He is also interested in studies of gender and sexuality in the Middle East and is currently at work on a second project on LGBT and queer Iranian asylum-seekers at the United Nations High Commission for Refugees in Turkey. Yıldız holds a PhD in Social Anthropology and Middle East Studies from Harvard University. A former DAAD Research Fellow at Institut für Europäische Ethnologie—Humboldt Universität zu Berlin, he received his BA in Anthropology & German Studies, and his MA in Cultural Anthropology from Wesleyan University. He has been a visiting researcher at Boğaziçi and New York Universities, and completed a short-term residency with marra.tein—Beirut, Lebanon. The Wenner-Gren Foundation, Die Zeit Stiftung Bucerius Fellowship in Migration Studies, Cora Du Bois Charitable Trust, Harvard’s Center for Middle Eastern Studies and Weatherhead Center for International Affairs, as well as Northwestern’s Buffett Institute for Global Studies have supported his research and writing. 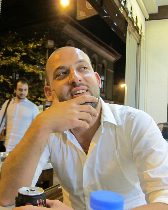 A former co-editor of Jadaliyya’s Turkey Page, Yıldız is co-editor (with Anthony Alessandrini and Nazan Üstündag) of the collection “Resistance Everywhere:” The Gezi Protests and Dissident Visions of Turkey (2014). Some of his recent academic publications and short-form writings could be found here.